Wow! Thank you so much for your informative website! I enjoyed seeing the various sculptures you have made. I have searched the web over for a site such as yours. I am not artistic by any means and the last time I made a paper mache project was in elementary school!! Years later, here I am, my daughter in elementary school and an assigned science project. The assignment is space missions and she chose the Sputnik I as her mission. 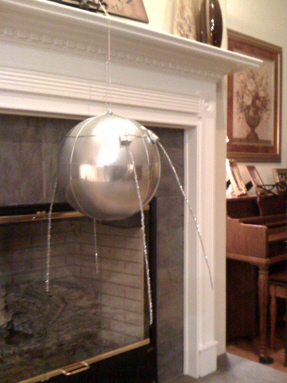 The Sputnik was about the size of a basketball and of course very smooth as any any satellite would be. I can certainly use a balloon, beach ball, styrofoam ball, etc.The problem is that the Sputnik had 4 attached antennas that hang from the satellite almost like tentacles from a jellyfish. If I use any of the items mentioned, I am limited to how I can attach these, and frankly, I am worried that the antennas will not stay in place. If I use paper mache, I could attach, I think, with hot glue gun, etc. Plus, I could also get the polished finish for the satellite that I seek. Then, justÂ finish with metallic silver spray paint. I am hoping I can get your input since your sculptures were so awesome! I do not know how to start. I do have your recipes printed and I am ready to begin. Would the easiest design be to use a beachball or balloon for mold, then apply strips of newspaper or brown paper? How many layers should I apply? Also, can I still sand the finished product using any of the paper mache recipes? I would appreciate greatly any ideas and suggestions you may have. So here’s my answers – keep in mind that I almost never sculpt anything that doesn’t have a nose, so I have no experience at all. I’m sure you’ll think of many things that never occurred to me – and I hope you’ll put your suggestions down in the comments section below. First, I agree that you should use something round on the inside. My choice would be a Styrofoam ball, if you can find one. The reason is that you could drill holes through your dried paper mache skin into the ball, drop in some glue,Â and then poke the end of your antennae into the ball. That seems like a good way to make the antennae stay where they belong. Of course, this would work best if you used sticks, like the bamboo skewers you find in the grocery store, for the antennae. If you need something that’s flexible, I’m not sure my idea would work. Yes, you can sand paper mache. If you use newspaper or brown paper strips over a solid inner form, three layers should be plenty, if you don’t sand it too hard. You can make it even smoother by applying gesso over the sanded paper, and sand that, too. (If you have some wallboard joint compound and some Elmer’s glue-all in the house, you can make your own gesso. 1 tablespoon of joint compound, 1 teaspoon of glue. It sands much easier than paper mache, so I use it all the time on the outside of my sculptures). I think the best paste would be the plain flour and water, because it sands easily, but my blog visitors might have a different opinion about that. That’s all I could think of. Do you have any additional suggestions that would help make this project go faster or easier for Suzy? All ideas are welcome. enough to offer suggestions for my daughter’s school project. sphere is reflective duck tape. The antennae are silver pipe cleaners. From my point of view, the project was a great success, even if Suzy wasn’t able to use paper mache to build her satellite. Sometimes you just have to scrap your first ideas and start over, right? i was looking for ideas to help finish a project. it just feels like it needs something. it should look like an old key, it is a gift for my husband. i used glue and water. Hi Amanda. Your key turned out really well, didn’t it? Sometimes when I make metal-colored items, I use a metalic wax over the paint. It gives the item a more realistic luster than paint alone. They aren’t expensive. But your key actually looks great in the photo, just as it is. thanks so much, i was worried because it looked too plain. my next project is a camel, wish me luck. Ooh – a camel! What a great project. They have such interesting faces, and those huge, lovely eyes. I hope you’ll let us see it when it’s done. of course, i’m glad i stumbled upon your website! Also, the positioning of the antenna are more to the top/sides than directly behind the ball. Only additional thing I can suggest is related to the antennas. If you twist a clothes hanger around a round object ( ive used a screw driver handle in the past) then twist it into the mass it stays in pretty darn well. ive also used Window foam ( from any hardware store) that I inject around the antena inside the ball. I’ve never used a foam ball but that sure sounds like it would work. also if you use wire like hanger wire, make sure you wrap it in masking tape so your paste will adhere to it. Thanks to you both for your ideas. The project is due Thursday and I will submit a photo.